You are here: Home » About Us » Staff » Colleen Klabo, Psy.D. Dr. Colleen Klabo graduated in 2010 from Alliant International University in San Francisco, California and completed her post-doctoral residency at NNH. Colleen also recently completed a fellowship at the University of Massachusetts Boston Infant-Parent Mental Health Post-Graduate Certificate Program in Napa, CA. 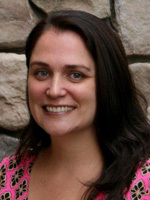 She has experience conducting therapy and assessment with children, adolescents, and families. Colleen specializes in working with children ages 0 to 6, parent-child dyad therapy, foster care and adoption, and infant-parent mental health.